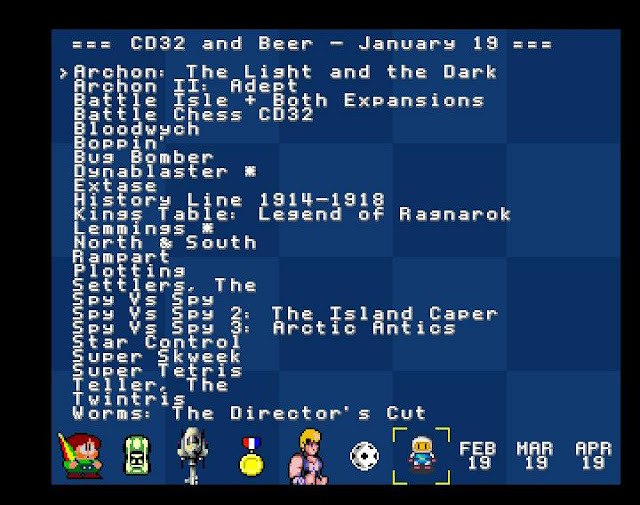 Indie Retro News: CD32 and Beer multiplayer compilation January 19 edition! CD32 and Beer multiplayer compilation January 19 edition! Another month and another CD32 and Beer Multiplayer compilation, and unlike the previous ones we mentioned featuring platformers, racers, vehicular shooters, sports and fighters this one is for the people who like strategy and even RPG's! Yes indeed Earok is back with another great Amiga CD32 pack and for those of you who love a good strategy or RPG will be pleased to learn this one doesn't just have the classic ' The Settlers ' game, but 'Star Control' and even 'BloodWych'! As we said before in the previous compilation, for those of you who missed out on the previous games worry not, as according to Earok the January edition contains all of the games from the previous releases (with one or two fixes). So that means over 170 games to play ranging from Sensible Soccer, Goal, Bubble Bobble, Pang, Parasol Stars, Rod-Land, Lotus and Micro Machines. To Apidya, Blood Money, Swiv, Phobia, Protector, EPYX California Games and even Ski Or Die!